There are 2 ways to work with Images. 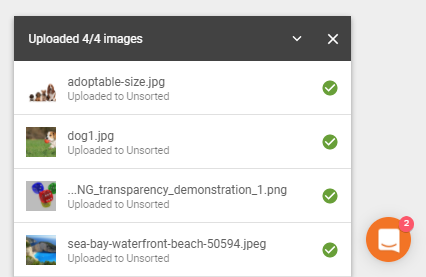 You can add images to your gallery and save it for later, or you can add it directly to your template while you're working on it. Let's see how we can do both. Go to the Photos page (red circle) and click on Upload Images (blue circle). - seen below in image. Click on Upload image and follow step 2 above. To add an images to your template, select the image by clicking the small square on the left corner of the image, and click the green button Continue.